Why did President Lincoln, a concerned, caring, conflicted, and careworn president, come to Gettysburg for only 25 hours on November 18 and 19, 1863? The governors of the 18 Union states that provided soldiers to the Union Army of the Potomac, who had fought and died there, not the Federal government, organized and managed the cemetery dedication ceremony. The President was not invited as the keynote speaker—indeed, he was asked to make only “a few appropriate remarks.” Yet he accepted that “secondary” role in the midst of the American Civil War with no end in sight—Why? Gain a greater appreciation of the immortal Gettysburg Address in light of the real back story, the enormous personal, political, and policy pressures impacting the president, and a fractured country, how this leader overcame them, his purposes [gratitude, equality, Union] and how the president achieved those objectives in his short, masterful presentation. Each of those pressures are particularly described in John’s presentation. 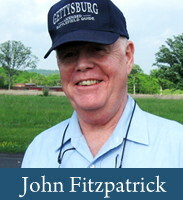 John Fitzpatrick is a Licensed Battlefield Guide Emeritus at Gettysburg having guided there for the past 14 years. John was a Senior Corporate Counsel in the Chevron Corporation Law Department for 32 years [including serving for 10 years as a facilitator in Chevron’s internal “Chevron Leadership and Management Forum”], retiring in 2006. Prior to entering Law School, John served on Active Duty as a United States Marine Corps Officer—Pilot, Tank Platoon Commander, including a Vietnam tour of duty where he flew 140 combat missions. Captain Fitzpatrick was Honorably Discharged from Active Duty in 1971. Contemporaneously with his civilian law and Arbitration career [admitted to practice in CA, PA and DC], he transferred to and served as an Active Reservist Pilot with the PA Air National Guard, then Legislative Liaison and finally as a JAG expert in Arbitration and Mediation in the United States Air Force Reserve, OGC, in the Pentagon. Colonel Fitzpatrick transferred to the Retired Reserve in 1997. John, an Honors Graduate of Villanova University and the University of Georgia School of Law where he co-authored and published a Law Journal Note on the legal issues involved with the U.S. recognition of China, now divides his time amongst Guiding at Gettysburg, volunteer Veterans’ Activities and his national and international Commercial, Construction, Securities and Securities Employment Arbitration practice. This entry was posted in Meeting archive on April 10, 2018 by hlj.